Canadians: We’ve heard your cries. Here at The Penny Hoarder office, we hustle to cater to our readers. Unfortunately, we don’t have the capacity to fully cater to an international audience. Not yet, at least. However, this is a break from your regularly scheduled programming. Earlier this year, we found 13 websites that host work-from-home jobs. A great resource, I might humbly add. 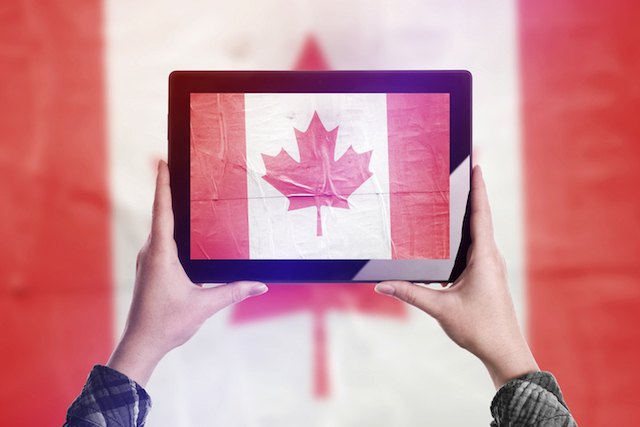 Now, in addition to that list, we’ve found even more sites — but for Canadians. I actually found Jobspresso on my previous work-from-home job website search. Little did I know, it was crafted with love in Toronto. This site specializes in remote jobs, so you won’t have to sort through the job listings like you might with some of the sites below. The best way to navigate this site, in my opinion, is to search by category: designer, developer, marketing, project management, support, system administration, various and writing. You can also narrow your search by the type of work: contract, freelance, full time, part time and internship. You’ll then want to take a look in the location column of the job listings to make sure Canadians applications are accepted. We love Indeed. And no, we were not paid to say that. It’s a huge job posting database that sees more than 200 million unique visitors a month from more than 60 countries, according to its About page. Hint: That’s a lot. Lucky for you, Indeed has a Canadian extension. Simply type “Work From Home,” “Work At Home” or “Remote” in the search bar, and start perusing. If you find a promising job listing, be sure to read through the post about any location contingencies (i.e. must live in the Calgary area). If you scroll down to the bottom of the listing, next to the date it was published, sometimes you’ll find an “original job” link you can track back to the company’s site. Here’s another site we love using: Glassdoor. Surprise! It has a Canadian option, too. Canadian Glassdoor is just as sweet as the parent site. We love it because it’s so transparent. Here, you can find company ratings (from current or previous employees), salaries and information about hiring processes. The best way to use the tool is to leave your location blank and simply type in “Work From Home” in the keyword box. You’ll easily be able to click through the job postings without opening millions of tabs or new windows. I’d like to note, however, that this “work from home” filter isn’t perfect. Like Indeed, you’ll want to scan the listing to be sure it mentions work-from-home options. The easiest way I do that is a Control + F search of “work” to highlight the good stuff. Personally, I’m a huge fan. And, once again, it has a Canadian counterpart. However, you don’t even need that to find work-from-home jobs in Canada. And you also don’t need an account. Like Glassdoor, the filter isn’t flawless. Some jobs might allow remote work once a week, some might be field jobs. Some might not even mention work-from-home. However, I found a few gems in my quick preliminary search, so I think you could, too. FlexJobs doesn’t exclusively house work-from-home jobs. Rather, it holds thousands of “flexible jobs,” which includes work-from-home jobs, but also part-time work, telecommute options and contract or freelance gigs. It’s a great place to get started, though. At the top of its homepage, select “Jobs” then click “Advanced Job Search.” On the right side, you’ll find an international option; select Canada and hit “Enter.” Or just go to its Canada section. Right now, there are more than 1,800 listings for you to pan through. I’d never heard of this site until I started this dig. Workopolis claims to be Canada’s largest career site; its database is searched 16,000 times a day. I searched “work from home” (or try “work at home,” too) in the keyword box — left the location box empty — and 6,500 results popped up. As I scrolled through the pages, a lot of the listings were repeats, but were, in fact, work-from-home opportunities. Many even said so in the title. Overall, there aren’t 6,500 unique work-from-home positions available, but there are quite a few, so clicking through the results seems worth it. Shoutout to our editorial fellow, Kaitlyn, for finding this; I’d never actually heard of the site. You can jump from country to country, but for the sake of this, we’ll settle on Recruit’s Canada version. Simply type in “work from home” in the keyword portion; leave the location blank. It’ll ask if you want to sign up for email updates, which might be helpful. The site is like a less legit-looking Indeed, but it generates some promising work-from-home job leads, so check it out. This is the home of startups, which, from my experience, tend to favor work-from-home flexibility. Start at AngelList Canada. You’ll see companies, investors, followers and finally jobs. Select jobs. From there, you’ll begin your search. “Find a job,” then create an account. I always just opt to connect via Facebook. You’ll end up creating a profile, and it’ll all look similar to LinkedIn. From there, you can start searching for work-from-home opportunities. Your Turn: Did I miss any good sites, Canadians?